Scholarships for continuing education & professional training in the management, preservation, & stewardship of cultural heritage. Providing seminars in historic preservation & cultural resource management to those working in government & private sectors. "The most helpful class I've ever had -- good nuts and bolts." 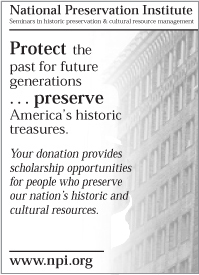 "Preservation is a field that is always underfunded...having scholarship funds available for preservation professionals to attend the seminars is critical...the availability of the scholarships is often the difference between someone being able to attend the seminar or not." "Thank you for the scholarship to attend the 'Introduction to Section 106' Seminar last month! The instructor did a great job making the information understandable! This week, I completed my first Section 106 documentation project using the knowledge gained from the seminar." "As someone who works in historic preservation, I rely on your seminar series as a guide to what I should know about." "Thanks to you and the Institute for putting on such a great course and for having someone so experienced to lead the discussion. Although I'm a backdoor novice to this discipline, I've danced around enough historic building and significant structures in my career to know that I need to be aware of a whole host of issues and to know that I need more and more education."